I paint art that makes you smile! My passion is color and whimsical spins on birds, flowers, critters and more. I love to share joy through my art. Life’s so short - let’s be happy! Claudia True’s art is a visual feast of color and fun! Her paintings are about loving life and about finding joy in our short time here on earth. Her past career included extensive travel as a geologist. Her work is influenced by time spent outdoors in the spectacular southwestern United States and parts of Mexico and Indonesia - learning from the earth and connecting with its unspoiled beauty. Colors and subjects in Claudia’s work are influenced by her youth in South Texas and the strong Mexican culture, and years living in the amazing sunshine of California! Her bright flowers and landscapes reflect these magical memories! Claudia's paintings are also inspired by the Fauve's strong use of color, Georgia O'Keeffe's simplified subject matter, and the fun of Peter Max! And now - living in Kansas - the influences of nature continue. The oh-so-colorful birds and butterflies and flowers and vegetables in her yard find their way into Claudia’s whimsical art! Claudia combines her two passions - painting and cooking - in an annual art and food calendar. Each month features a friend's family-favorite recipe brought to life in story and a painting by Claudia. These calendars are collectable and provide art and recipes for years to come. Claudia's line of critter and food art originated with this calendar project. 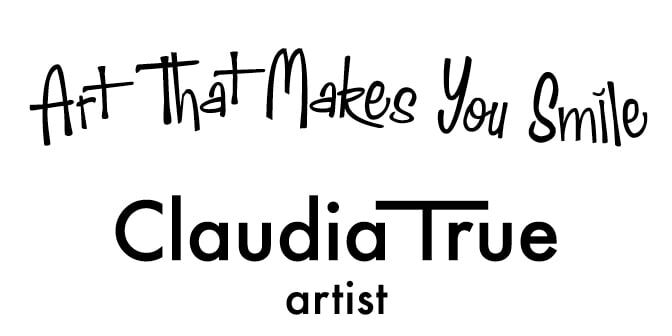 Prior to moving to Kansas City in 2007, Claudia owned galleries and studios in Bakersfield, California. Now she works in her home studio and teaches private lessons as well as workshops in California. She loves to teach and share the joy of painting with others and to help them develop their own creative spirit. Life’s an adventure! With Claudia’s paintings, she shares some of that adventure and love of life - from a tiny bird to a magnificent landscape. I wrote this in 2002 and it still captures my "journey" from the safe but hectic corporate world into the less safe, still somewhat hectic but wonderful world of art. It's been quite an adventure! I still feel so fortunate to have found my way and to have been brave enough to pursue this path. Enjoy! "This recent journey as an artist started a little over 7 years ago - winter of 1995 to be exact. I was searching for a creative outlet from my stressful corporate job and took a painting class through the "extended university" program. I had painted as a child but had been away from it for a few (!) years. I immediately felt a connection with the paints and brushes in this new class - little did I know this was the beginning of a major life and career shift! My previous career was often exciting and satisfying as a geologist/manager for the energy industry. My small Texas world was expanded to places I could never have imagined - including living in field camps in Utah and Wyoming for extended periods of field work, and working in the jungles of Indonesia with no electricity or running water. One time I was floating down the river in Indonesia in a utility boat filled with food, supplies, and live chickens - watching the Orangutans in the trees and thinking, "little girls in Texas can't even dream about this!" My personal travels took me to interesting places in Mexico, Australia, Canada and many parts of the U.S., especially in the southwest. My mind and experiences were enriched in ways that I'll always cherish. My memories are a deep well of images from the most amazing places and cultures and people. During my field work, I was often "alone" and I learned to appreciate the quiet times - something that eventually was lost in the hectic pace of corporate life and my life in general. When I started painting, I remembered the power of those quiet times. I became obsessed with painting and drawing and creating - and "connecting" through the quiet. I found my passion and pursued it full steam ahead - knowing that I had to do many "awful pieces" to get to the good stuff. Once I had some basic skills, I started risking and creating things that seemed to come from nowhere! That's the excitement of the creative process!! I started experiencing those breakthroughs that creative people talk about - and then I was hooked!! At "50 something", I took the big leap to pursue art full time. A few years of life give you the experiences and wisdom to understand your dreams, and the confidence to follow them. Now I'm bold enough to paint what I want and I'm loving the journey to see what that will be!" Arts Council of Kern, Ca - "Claudia True and Friends"